Editor’s note: This is the eleventh installment in a series of dispatches from the Rath family (Colin & Pam, daughters Breana, Meriel and Nerina), who departed Stamford, CT in the fall of 2014 for a worldwide cruise aboard their Hanse 545 Persevere. You’ll find previous articles linked below. Barcelona has a rich history and lots of alleys to ride through, playing bike tag and sightseeing. Barcelona has a great bike lane system throughout the city. We were able to go everywhere on bikes. The first Gaudí stop was Casa Batlló, built in 1877. Gaudí was highly criticized for its radical design while it was being built. He used constructive elements of the Modernisme (Catalan Art Nouveau) that include ceramics, stone, and forged iron. 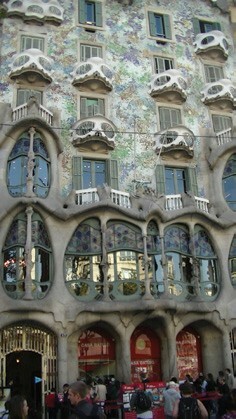 The apartment complex was completely designed by Gaudí as freeform; no plans were drawn. He built models for his craftsmen to build from. The place was full of compound curves, not a right angle in the whole building (which Pam & I love). The entire building is a piece of art, from ceramic tiles cut to curve with each intricate detail, massive, hand-carved doors, and brass apartment numbers designed to Gaudí’s personal alphabet. It was truly incredible. 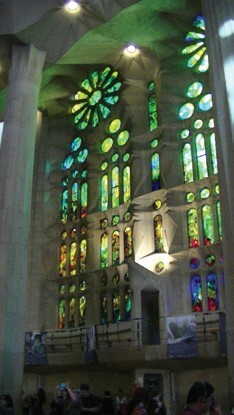 But that was nothing compared to La Sagrada Familia. Work on Gaudí’s cathedral began in 1892, and it’s still under construction and not expected to be finished for another 15 years. He designed an inverted arch that was made from models, as with Casa Batlló. There were bags of sand held by string, and that designed the arches in the church inversely. A lot of natural patterns were used in his design. The arches resemble the spreading branches of a tree. The stained glass windows were different on each side of the church, each invoking a different emotion as you walked. The Museum below the cathedral was remarkable, with all of Gaudí’s models and concepts of his architecture. Get a guide to have a complete view – there are a lot of hidden gems. Gaudí is actually entombed there. There are little Gaudí touches throughout the city, with the street lamps, bus stops and market signs everywhere. We spent a week touring the city and loved La Boqueria Food Market, a great place for inexpensive lunch and fresh produce. There are little booths with barstools that sell fresh cooked seafood and local dishes. It’s a terrific place to meet the locals and have a drink. We decided to visit Ibiza next, to hear some world music and have an adult night at the clubs we heard so much about. It was off-season when we arrived, which was nice because we got to meet the locals and the chandleries were actually having sales to clear stock for next year. Ibiza has great flea markets and live bands entertaining you as you shop. The girls loved all the beads and incense, as well as beautiful beaches that transform into nightclubs during happy hour. The stadium nightclubs, which have fog and bubble machines galore, don’t get going until 2 am. You usually quit around 8 am and go out for a big breakfast. We were there for a week and decided to change our itinerary. We had planned to stay in the Med for a year, but after the Paris attack we decided to head to warmer climate after spending a summer in England. We signed up for the Atlantic Odyssey with Jim Cornell that departed on January 9, 2016 from the Canaries to Martinique. They had 17 boats signed up, some with families. The kids liked the idea of meeting new sailing kids, and we liked crossing the pond with a group. We sailed back to Gibraltar to get supplies (cheap diesel, duty free provisions and Christmas gifts). We stayed for a week and got the new cat shots done for travel abroad, caught the James Bond flick Spectre, did some minor repairs, filled up with some 80 pence diesel, and off we went. Now, we couldn’t just go to the Canaries directly and not see Morocco (especially since it was in the Bond film). We sailed into Rabat on the way. Sailing in was quite an introduction to the country – every fisherman came by to see if we were willing to trade cigarettes and real Coca Cola for fish, and we got a standing ovation heading up the river to the marina. Fortunately, we had a little time waiting for the tide to come into make into the marina to take it all in. The Bouregreg Marina is across from the city of Rabat, but you could get ferries rowed across for two Dirhams (about 50 cents) or take the train to Rebat, Medina and Casaba. We had a great time bargaining at the Medina (huge flea market). They sold anything and everything. The best was restaurants selling camel meat – yes, camel – that had it cooking right in front of you. They pick the meat off the head and serve it with sauces. Everywhere we went we had tea – a really potent, sweet tea, like Red Bull with a saucer. The spices, rich, full and raw, were wonderful. We ran into another British couple that had converted an Irish trawler and are sailing around the world with their two kids. They’d spent seven years gutting the wood trawler, and actually cut down a tree and shaped it for the mast. Truly unbelievable. They can be followed at Trawlertravels.blogspot.com. Nicest people around. 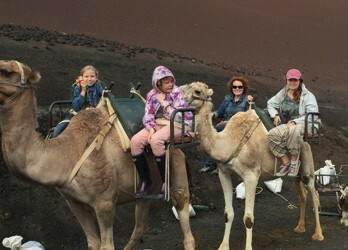 Our families spent eight days exploring Rabat and bargaining. They actually sailed to Tenerife with us. We got there ahead of them, but we did a lot of exploring together. More next month as we prepare to sail across the Atlantic.